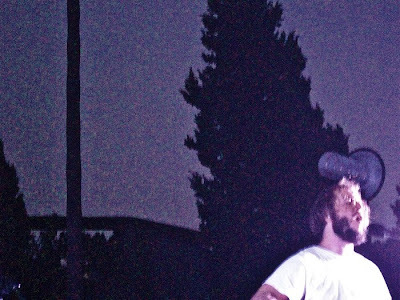 Elvis Enthusiasts Unite: Bon Iver Goes Hollywood. Don’t assume all Californians are jaded, disgruntled and spoiled. Yes, L.A. gets the unique privilege of seeing most bands that matter pass through its city (a lot like those East coasters). And, sure, one might go on to think they consider it all so pass-EH. It’s one of those tempting notions, but try biting your tongue on this one. Just for a minute? 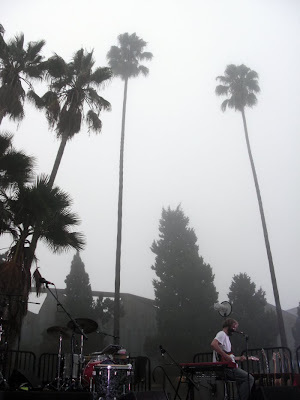 They are, after all, the ones who blessed Wisconsin’s Bon Iver with a sold-out performance at the Wiltern a few days back, then going on to do it all over again in the wee hours of Sunday morning in Hollywood. In a graveyard. As the sun was trying really quite hard to come up. Not only did that show sell out as well, but there were reports of the last remaining tickets going for four and five times the original amount ... and those in search of experiencing the “weirdest thing [the band] has ever done” (frontman Justin Vernon’s words) couldn’t buy them fast enough. Maybe it had to do with the band’s decision to go on hiatus for a spell. Maybe. And maybe it had more to do with the fact the band catapulted to fame on the strength of one solid album, a fairly remarkable backstory (don’t act like you don’t know it) and gone on to do pretty much everything the boys have wanted to do, whenever they have wanted to do it, at any spot in the world that felt right at the time. I’m banking on that second option, but I’m a man who holds to a couple strong opinions. Is this what they call digressing? Is it? I blame the driving 700 miles or so to see the band, getting a bit of a nap, hitting the show and being too amped to get back to sleep. It’s nearly 5 in the P.M. and my eyes remain open. That gray matter tween the ears is all numb and tingly. And yet, the hands continue. If this is considered the beginning of a series of send-offs, it was enough. If it all goes downhill after this, it’s still okay. And, if his was Justin’s attempt at achieving some kind of storied musical glory, he pretty much succeeded. It was like Bon Iver had planned a musical festival, only they ended up being the only band in the full eight hours long experience. Everything that led to their being that much-anticipated finale was carefully orchestrated by Justin—playing just two hours of music wasn’t enough. Those couple highly eclectic DJ sets? The ones that sounded like a schizophrenic iPod playlist, including everything from Captain & Tennille to Dirty Projectors to Ibrahim Ferrer on them? Hand-selected by Justin. Playing Bottle Rocket at one point and throwing up some jungle footage from This Planet Earth on the side of a mausoleum? Totally his idea. 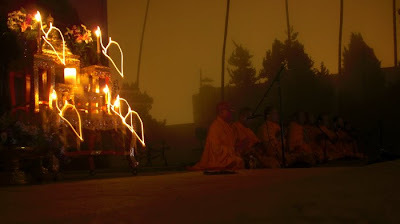 And I’m just spitballin’ here, but I’d guess that whole bit where the Buddhist monks came on and blessed the audience and the stage? Where they chanted while everybody was either asleep on their blankets or holed up in sleeping bags or some combination of the two? I bet Justin wanted to see that happen as well (and it somehow ties into his Volcano Choir move, I just know it). 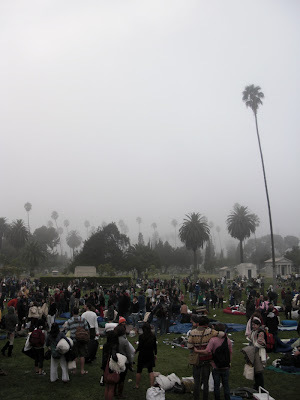 I’d like to go even further out on this realm of thought and declare he had everything to do with the fog that hung around Hollywood Forever Cemetery, the one that should’ve caused all attendees to scribble out the “Sunrise” of the “Bon Iver at Sunrise” title on their respective ticket stubs. It’s not so hard to believe, right? The sun never did quite show up for this party, but a red sky most certainly did. And that was good enough. Several glances up at the palm trees against that sky solidified that. Justin sounded as good as he ever did ... all raw, falsetto emotion, packaged for the masses, backed by percussion and guitar and the occasional foray into distortion. He even had his bearded buddies Megafaun out for a song. As for the rest of the band? They performed for a mellowed crowd that morphed into a “morning after” one. It even made sense to hear him do it just past six in the morning. There’s no real easily explainable reason why, either. But, well, here’s a stab: it’s that Bon Iver sounds as good at night as it does when it doubles as an alarm clock. It’s the equivalent of a lover shaking your shoulder gently to wake you up, an action you follow with the day’s first sleepy smile. Yeah, like that. Put that on the a sticker and slap it on the reissue, be my guest. I can only imagine that he made more fans of his music Sunday morning than had even bought tickets. Who’s to say those buried in the crowd didn’t appreciate the gesture? Maybe even Dee Dee and Johnny Ramone—who both call that place home—can get behind the songs in his catalog? Either way, the living ones left happy. It was a party they didn’t want to end. “How about we do this all again sometime?” Justin says, pausing. After some thought, he follows with: “No, how about we never do it again? How about that?” If he sealed his band’s fate with those words, you know? That’ll do. For a few videos of the concert grabbed by Yours Truly, go have a gander over HERE and see some of what I was able to (fog included). You won't be sorry ... at least, I don't think you will be. That's so, so cool that you were able to be there. yea it was kinda magical... in a way that life in L.A. often isn't. your videos capture a chilling reverence. thank you. Hey there, cool blog. Don't know how i stumbled onto it, but i was at the Bon Iver show as well. I have seen a ton of bands/performers over the years. Shows, such as: Tom Waits, TBC, Phish, Dylan, Wavves, Crocodiles, Flips, WSP, PJ, The Dead, Animal Collective, all things Jack White, YYYs, No Age, Levon Helm.....well, a wide array of music. I had no idea what I was in for Saturday Night at the cemetery. Bon Iver was spectacular. It was amazing to see a legend in the making playing such an unsuspectingly monumental show. I have to say it was one of the greatest musical moments I will ever experience. Bon Iver is simply sick live. Such a great experience. Keep up the cool blog.